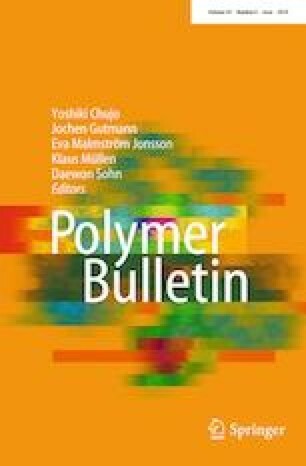 Preparation and identification of block copolymers comprised of PNIPAM and poly(ionic liquid) of pyridinium sulfonate by two different approaches through changing the order of monomer addition has been reported. Controlled synthesis is performed via reversible addition–fragmentation chain transfer polymerization. Pd nanoparticles (PdNPs) are immobilized onto these block copolymers to utilize them as thermo-responsive catalysts. The block copolymers and their corresponding catalysts were characterized by varied techniques, i.e., FTIR, NMR and UV–Vis spectroscopy, ICP, TGA, DLS and X-ray diffraction. SEM and EDAX were applied to analyze the surface of the sample and its composition. Furthermore, TEM was used to obtain the size of PdNPs and their distribution in the polymer matrix. The catalytic efficiency of the catalysts was examined in the Heck coupling reaction for the production of butyl cinnamate. The online version of this article ( https://doi.org/10.1007/s00289-018-2532-6) contains supplementary material, which is available to authorized users.